The cartoon seeks to make fun, but I find it quite serious. Is there any other way to teach meditation than in the language of those you are teaching. If one teaches a kavvanah from Rabbi Isaac the blind or Rabbi Moses Cordovero does one teach medieval cosmology and medieval science to explain it? 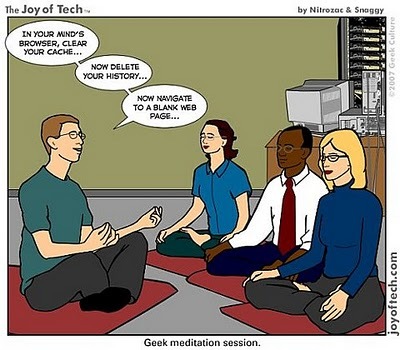 What if it is a once a week meditation class and one wants to get down to practice. Should one use the language of bittul or of “clear your cache and history? Should one imagine light at the bottom of emanation or a blank web page? Is this modernizing into new age like neo-hasidism or the only way to do things? This entry was posted in kabbalah, meditation and tagged jewish meditation, kavvanah, meditation. Bookmark the permalink. This is super! We should always use contemporary imagery, as I’m sure the ancients did. My sense is that they tried to depict their visions to their audiences in ways that would “bring it home” to them. After all, at bottom — how express anything erudite unless you express it graphically and tangibly! The content of this blog does not reflect the views of the State Dept, CIS, or USIEF. Nor of Seton Hall University. You can contact me at Kavvanah at gmail.